We've had a pretty day or two but over all it is still chilly and rainy here. I am soooo ready for brighter, warmer days! Wanting to add a bit of Spring in the foyer I combined a silver tray and pitcher with a few spring blooms to make an arrangement for the hall tree. Hope you will add Amaze Me Monday to your party list! It's not to late if you'd like to join this weeks party at AMAZE ME MONDAY! Hope you will add to your Monday party list! You have such a beautiful foyer and the silver adds a very pretty touch! Very Welcoming indeed Cindy! Love the flower arrangements! I don't know which is prettier, Cindy, the arrangement or Ellie Mae?? Both are beautiful! Beautiful , Cindy!! You have some lovely things but I really love your hall tree/bench!! Stunning!! You have a beautiful foyer! I really like the silver tray and pitcher. I have a "helper" too, that follows me around. :) We have really warm weather now, but it's supposed to rain soon. Hope you have a great day! Finally we've had two days of warm weathers. I'm wearing shorts. Oh the flowers are so pretty! We are so ready for Spring here in Tennessee but it keeps teasing us! Actually, *finally* we're having sunny days and warm temps! 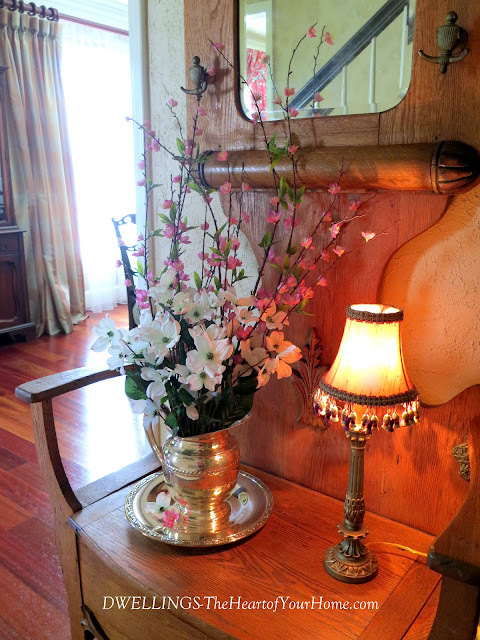 I love your foyer ... your beautiful floral arrangement is gorgeous! Fairly decent weather here, but it's expected to change as the weekend approaches. Your foyer looks great! I know I've said this before but your front doors just wow me. :) I can't wait until we've been in our house long enough for things to seem homey like your entry is. They look very stately in that silver pitcher for sure. Beautiful! Silver shines up everything - and those flowers - simply delightful! I'm ready for the chill to be out of the sunshine - and enjoy a bit of Spring before it feels like summer. Your foyer is beautiful Cindy. It is dreary, cloudy, rainy here, today. However, yesterday was beautiful and sunny. I'm looking forward to more sunny days. Hi Cindy....looks solo pretty...looks so inviting! !...LOVE Spring! We are having a beautiful spring, and this afternoon we are actually getting a little rain. Hoping for more rain here. Your foyer looks so sunny and beautiful. Love the pink and white flowers for spring. I love white and pink flowers together. Your foyer is very welcoming. Today we had sunny spells, but it's not as warm as it's supposed to be in May, even in Brittany. Love your hall tree! It is very similar to the one in our foyer which belonged to my husband's great-grandmother. Yours is a bit more ornate than ours, but the size looks about the same. I'll definitely be sharing this post with my husband.